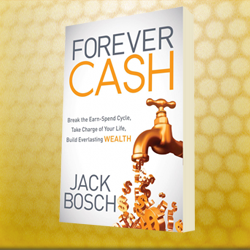 And more recently I changed the name of my members’ only coaching program to the Forever Cash Gold Club. Both the book and the program were designed to help people to take control of their finances and to get out of debt. There is so much misinformation out there that I find myself spending more and more time clearing up the lies and reeducating folks on the basics of making and investing money. But let’s say that there was no misinformation out there. No financial advisors telling you to invest in a 401k and no one saying that real estate is a bad investment. Let’s go a little further and say that making a better future for yourself didn’t involve being a contrarian and experiencing negative peer pressure from those around you. In a beautiful world like that, all you would need to know about your personal finances could be summed up into two lessons: 1) Make more money, and 2) Invest in cash-producing assets. Let me expand a little on each lesson. 1) Make more money. Most folks make just enough money to match their monthly expenses or just below – most don’t have a lot of cash let over at the end of the month. So what’s the solution? While reducing stupid expenses is a valuable part of the process, most folks will need to make some extra money somehow. Before I continue, let me caution you: I don’t want you taking a second job to make more money. Doing so would not be a smart move, because you will still be in the “trading hours for dollars” mentality that I want you to get away from. Plus it will make your already hectic schedule even worse. And neither an I talking about buying a franchise or focusing on a startup – both are risky and require experience that you may not have yet. I want you to focus on methods that will give you the biggest bang for your buck, the biggest return on your investment of time and money. A method that has worked well for my students and I is flipping real estate – both with and without houses. Each deal can usually be done in 5-10 hours of work, and the return can be several thousand dollars for each one. Or consider a micro-business selling a product online. All you will need is a computer with an internet connection, a phone, and a few hundred dollars. Your initial investment is small but the returns have the potential to be very large. Once you have spent some time generating seed money, how should you invest that money? In a perfect world, all folks would need to learn are these two principles, and once they put them into practice their money concerns would disappear. But in the meantime, I’ll keep fighting a war of information against the financial planners who don’t have your best interests at heart.